Lana is the Managing Director of Hikma Ventures which she helped establish in 2015. Lana started her career at Hikma Pharmaceuticals PLC in 2012 as the Assistant to the CEO and Director of Corporate Strategy & Development where she worked on strategic projects across the company’s various functions including strategy, M&A, operations and finance. Prior to joining Hikma, Lana worked as a Financial Analyst in the Mergers and Acquisitions department at Dresdner Kleinwort Investment Bank in London where she worked on transactions for clients across multiple industries. 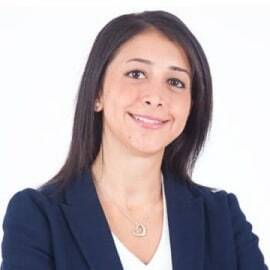 Lana also currently heads the Innovation & Leadership Advisory Board (ILAB) at Hikma which consists of  young Hikma employees whom share a dedication to advancing Hikma and ensuring it is at the frontier of innovation. Lana holds an MBA from Harvard Business School (HBS) and a Bachelors of Commerce degree from McGill University.